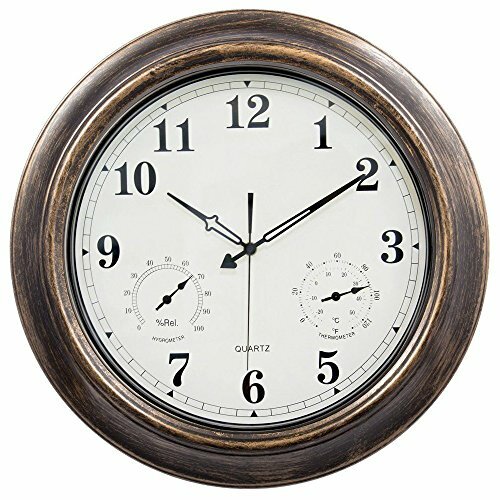 Ing-Never Stop 18 inch wall clock reports the time, temperature, and humidity at a glance. The sturdy and waterproof metal frame will ensure the functionality of your clock holds up outdoors,stay up-to-date with the time. As an additional perk, the clock features in the lower left area of the face a hygrometer that measures the percentage of relative humidity in the air.The lower right has an analog thermometer that reports the temperature in both Celsius and Fahrenheit. View More In Outdoor Clocks. If you have any questions about this product by Ing-Never Stop, contact us by completing and submitting the form below. If you are looking for a specif part number, please include it with your message.